Q: When are Nation dues required to be submitted each year? A: Both State B.A.S.S. Nation dues and National B.A.S.S. Nation dues are due by December 31st of each year and are generally paid by the club on behalf of its members. Q: When I join a club, how much will my annual dues be, and where does my money go? A: Club dues can range from $50/year to $150/year depending on how active a club is. As you know, every organization needs operating funds and your dues help each level of the Nation provide the services and benefits you enjoy as a B.A.S.S. Nation member. Of the dues you pay at the club level, $30.00 goes to the National BASS Nation and $40.00 goes to the State BASS Nation. The remainder of the dues are your clubs operating funds for that year. Q. How do I get involved in the Illinois B.A.S.S. Nation? A. The Illinois B.A.S.S. Nation is an association of B.A.S.S. clubs around the state that are affiliated with Bass Anglers Sportsmen Society (B.A.S.S.). So the fist step as an individual is to locate a club in your area that is affiliated with the Illinois B.A.S.S. Nation. To find a club, go to the Region’s web page. 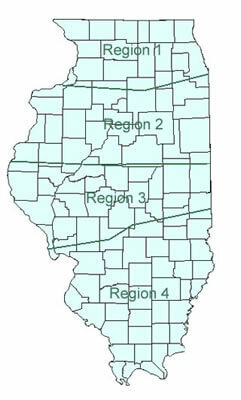 Each of the four Regions has a web page that lists the clubs in that Region. You can either contact the Region Director for assistance or contact a representative of the club nearest you. The club officers and members will guide you on how the membership process works. Q: How does our B.A.S.S. club become affiliated with the Illinois B.A.S.S. Nation? A: There are some basic requirements for clubs that affiliate with the Illinois B.A.S.S. Nation. There must be at least 6 club members and all members of your club must be a member in good standing with B.A.S.S. All required forms can be found on the section above. State forms and dues should be submitted to the Illinois B.A.S.S. Nation Secretary. New Boaters welcome / needed! Fill out the National Affiliation Application, attach a check for National dues and mail directly to B.A.S.S. Have each of your club members fill out a State Chapter Roster form, attach a check for the State dues and send all the forms to the State Secretary. This is the same form you use to submit your state dues and roster annually. To start a new B.A.S.S. affiliated club, read the Sample By-Laws, then complete the necessary forms.